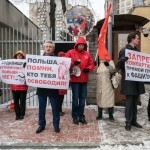 Demonstrating their solidarity with the Communist Party of Poland, and in continuation of the international campaign in support of Polish communists on November 29, 2017 the CPRF Moscow branch arranged a protest in front of the Polish Embassy in Moscow. 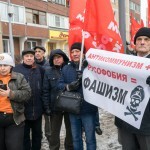 Russian communists protested the anti-communist conduct of the Polish government and anti-communist persecution of the CPP members. 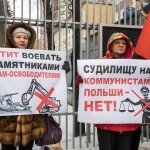 They condemned and denounces these anticommunist measures and persecutions launched by the authorities as well as national policy aimed at banning of communist symbols and propagation of communist ideas. This unacceptable persecution cannot be legitimized or justified anyway! 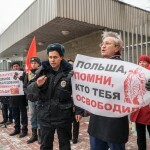 The CPRF believes that the persecution is a part of the general campaign pursued by the government to illegalize the Communist Party and boost anti-communist policy for rewriting history, removing monuments and renaming streets associated with communism, workers’ movement and victory over Fascism. 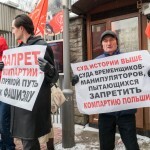 The Communist Party of the Russian Federation condemns the anti-national and anti-democratic policy pursued by the Polish government. 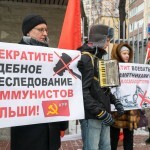 In this regard the CPRF demands the immediate halt of persecution against the Communist Party of Poland and its members. 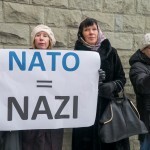 We demand that such attempts to rewrite history, blackmail the historical victory of the Soviet Army over Fascism made by the Polish government, cease forthwith. We express our solidarity with the communists of Poland! This entry was posted in International Activity on December 2, 2017 by adm.